Here is everything you need to know about ArchiMate, a comprehensive modeling language closely linked to the TOGAF standard, used by Enterprise Architects for the worlds top organizations globally. Over the last few decades, 'Enterprise Architecture' has become synonymous with corporate cohesion and efficiency. Any organization that operates without a clear idea not only of what it has to work with but also what it seeks to achieve, will struggle to avoid wasting time and money. It pays to know what you are doing, as they say. ArchiMate is designed to solve this problem by giving organizations a clear method for mapping out the construction and operation of their architectures. 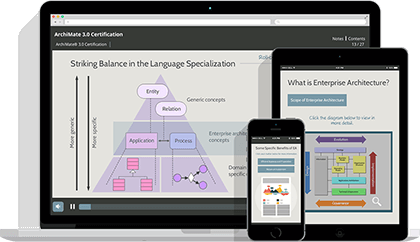 This open and independent ‘modeling language’ for enterprise architecture enables certified professionals to create visual corporate frameworks. Every department and its connections can be outlined, not only allowing decision makers to see what they have to hand, but also helping them to understand what kind of impact their decisions will have. Developed by The Open Group, ArchiMate has been continually refined and developed by some of the world’s leading experts in enterprise architecture. It outlines clearly the concepts and relationships that govern businesses, making ArchiMate-certified professionals highly sought after across multiple industries. It can even be integrated with other frameworks and methods, such as TOGAF, to ensure that it can be adopted painlessly. So, how exactly does ArchiMate work, and what does it really mean for companies and professionals practicing enterprise architecture? How Exactly Does ArchiMate Work? ArchiMate is a graphical language: a series of visual practices which help organizations to make graphical representations of their operations. In other words, it’s a set of instructions on how to create a map of your business! This ‘language’ provides a clear terminology, designed to make the process of creating these maps as unambiguous as possible. The end results can give any organization a much clearer perspective of the architecture that they have to work with. It can also enable them to communicate the consequences of decisions and make the best choices possible going forwards. The core framework of ArchiMate is based on intersecting ‘layers’ and ‘aspects’ which form interconnecting cells. Imagine a Sudoku puzzle, where each action in a column also affects a row, and you will have a fairly simplistic understanding of how it works. Any given stakeholder’s relative position within this matrix can determine what their main resources and concerns are. This kind of perspective is essential for enterprise architects, whose job it is to guide organizations and achieve wider business goals in a way that meets the needs of multiple departments. Importantly, ArchiMate also provides a body of knowledge which can support those who are interested in pursuing enterprise architecture. This can make ArchiMate a valuable career stepping stone. It can even be easily integrated with other frameworks and tools such as TOGAF and BPMN. How can an ArchiMate Certification Help my Business? Because stakeholder concerns can be illustrated so clearly in an ArchiMate framework, it can allow organizations to make decisions with a much more accurate sense of perspective. Identifying the connections between departments and decision makers can help architects to see where relationships can be refined. This, in turn, can allow them to make the overall operation much more efficient. With a clear enterprise model, an organization can show stakeholders how their concerns and requirements are being addressed. ArchiMate is vendor-independent. This prevents users from becoming locked into stifling tools or frameworks, while also allowing them to incorporate future developments such as emerging computer technology or architectural practices. The Open Group ArchiMate Forum can provide ongoing support for users. This can be a great source of inspiration and information for ArchiMate practitioners. Why Gain an ArchiMate Certification with Good e-Learning? Good e-Learning’s courses are developed by Enterprise Architecture specialists. This allows us to offer a variety of courses on globally-renowned tools and frameworks, including ArchiMate and TOGAF. Even better, each of our ArchiMate courses is accredited by The Open Group, the very organization behind ArchiMate. Our sales team is more than capable of recommending the best courses to suit your schedule and skill set. Whether you are a budding Enterprise Architect or an experienced professional, our content can help you gain an industry-recognized qualification that can benefit your company and even boost your career. The ArchiMate 3 Practitioner eLearning package comprehensively covers the enterprise architect tools, structure and modeling language provided by ArchiMate. The ArchiMate 3 Bridging eLearning package is designed to help both individuals and teams build on their knowledge of ArchiMate, including its most recent updates. Corporate customers can even enjoy bespoke e-learning packages built to suit their employees specifically. Does your workforce need immediate access to e-learning content which reflects their unique requirements and preferred learning styles? Good e-Learning can deliver the best content to suit you!